The BLS today reported a gain of 171,00 in nonfarm payrolls. The actual, not seasonally adjusted (NSA) number was a gain of 911,000. In the actual (NSA) data, October is always an up month. Last year the October NSA gain was 895,000. In 2010, it was 978,000. The 10 year average gain for October for 2002 to 2011 was 737,000. This month’s report was a good one, consistent with the trend. There’s a problem with the seasonally adjusted number. The SA number for this month will subsequently be revised in each of the next 5 years as the BLS attempts to fit the SA number to the actual change. It will also have a major benchmark revision in February, when the annual benchmarking process is finalized. The BLS headline number is really lousy data, but the market pays attention to it. In September, the August SA headline number was revised up by 46,000 and July was revised up by 40,000. Then this month both August and September were revised up, August by 50,000 and September by 34,000. The BLS will revise this month’s number, not only next month and the month after, but every year for the next 5 years as they hone the SA number to include a look back to pinpoint where this month’s number actually should have been. The truth is that the current SA number is a wild guess and a fraud. The BLS statisticians know it and have publicized that fact, but the mainstream media has ignored the warnings for years. We need to look at the best data we can find to know the truth about what’s going on. That’s the NSA data. The withholding tax collections are actual and real time, but from time to time may be skewed by factors other than the number of employed persons, so we need to be alert for anomalies in that data. The monthly employment numbers reported above come from the BLS the Current Employment Statistics Survey or CES, a survey of business establishments. The BLS also does a survey of households. To further complicate matters, the household survey or CPS — Current Population Survey– often tells a different story from the establishment survey. This month the two were consistent. As with the CES, in the CPS October is a month in which the actual NSA number always increases. 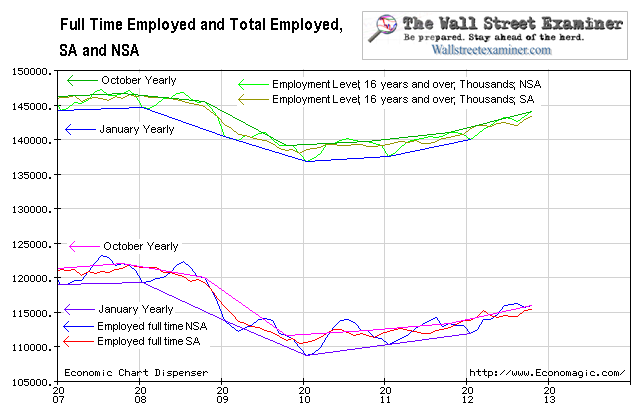 This year the number of persons reported as employed in October rose by 706,000 from September (Actual NSA). That compares with a gain of 485,000 in October 2011 and 34,000 in 2010. The average gain in October for the previous 10 years was 480,000. By this standard this was a very good month. The year over year gain was 2.2%. 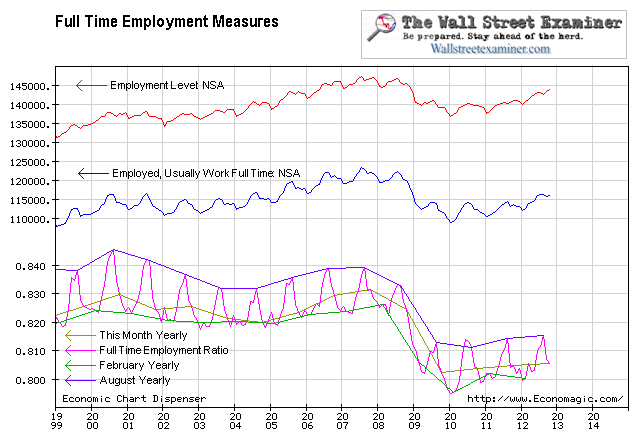 Full time, as opposed to total employment, is a key measure. Part time jobs are nice, and for many that hold them, they are a lifeline, but the important metric here is full time jobs. Without those, we’re dead. Full time employment in the CPS rose by 367,000. Part time jobs increased by 339,000. Last year full time jobs increased by 476,000 in October, but in 2010 they dropped by 43,000. The 10 year average gain in full time jobs for October was 81,000. This year’s performance wasn’t as good as last year, but it was significantly better than average. 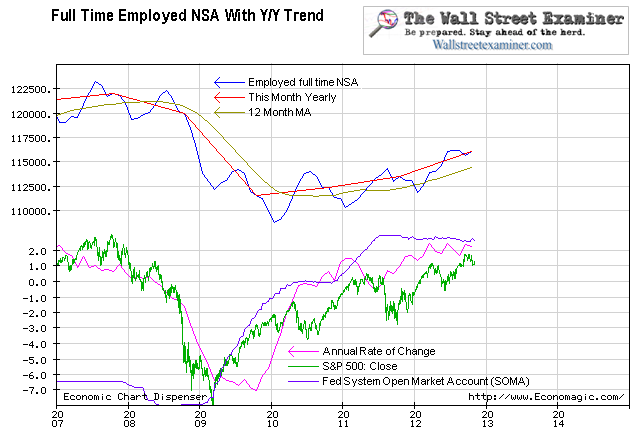 The chart below shows the year to year trend line connecting the October data in full time and total employment along with the raw NSA data and the SA fiction. The seasonally finagled data shows the trend nearly catching up in both series due to the big upward revisions to the July through September data. Prior to this, from March through August the SA line had been diverging from the actual trend, particularly in full time employment. June or July is usually the peak month for both total and full time employment. This year the numbers broke last July’s level in April. The economy was a couple months ahead of schedule in affirming the uptrend in jobs. That uptrend is still firmly entrenched. The gains have accelerated in 2012 versus 2011. With QE3, the Fed is adding more fuel to a fire that was already beginning to burn hot. Stock market performance is at the mercy of the Fed (or over the past 12 months the ECB, not shown), and employment typically reflects them both. Over the past year, the SOMA has not reflected the impact of the Fed’s MBS purchases from the Primary Dealers, a subject which I cover in depth weekly in the Fed Reports. While SOMA has stayed flat pending the first settlements of the QE3 purchases on November 13, the graph of Fed purchases from the Primary Dealers (not shown) has been rising steadily since last September. By cashing out the dealers via these MBS buys, the Fed enables the dealers to buy more Treasuries. The next week, the Treasury spends that cash. That’s how Treasury debt is immediately transformed into economic activity and slow and steady job creation. With new QE, the Fed will be adding even more cash to power that trend. The chart below shows that while the number of jobs is growing, the employment to population ratio has barely gained since the recovery began in 2009. The economy seems only to be keeping pace with population growth. Top line growth may satisfy the markets, but it is doing next to nothing to help the millions of people who remain unemployed. Their numbers are growing right along with the number of people who do have jobs. It is a sad state of affairs for the US, but markets don’t care about that.